.The C-40 Clipper is a military version of the Boeing 737-700C airline transport. It is used by both the United States Navy and the United States Air Force. The United States Air Force selected the C-40B, a military version of the 737-700 Boeing Business Jet, to replace the aging fleet of C-137 aircraft for U.S. combatant commanders. Four have been built. The Air Force awarded the medium lift contract in August 2000. By using commercial off-the-shelf acquisition practices and a new lease program for the C-40C model, the Air Force reached a benchmark for aircraft procurement. The C-40C was the first military aircraft to be acquired in this manner. The 201st Airlift Squadron, Washington, D.C. Air National Guard, acquired two C-40C aircraft in October 2002. 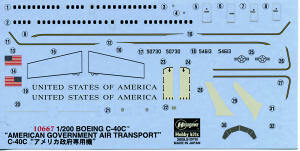 The C-40C is intended to replace the aging C-22. The 89th Airlift Wing acquired its first C-40B aircraft in December 2002. Both units are based at Andrews Air Force Base, Maryland. The 15th Airlift Wing, Hickam AFB, Hawaii, acquired its C-40B for U.S. Pacific Command in February 2003. The Air Force Reserve 932d Airlift Wing, Scott AFB, Illinois has acquired three C-40C aircraft in 2007. A total of six C-40Cs have been built. 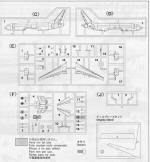 Unlike a recently completed B.737-500 kit by Hasegawa, this one is pretty much standard in the way the fuselage halves are treated. This one is split vertically as is the norm. The kit also has the engines and cowling split in half instead of being single castings as on the -500 kit. In concert with other newer Hasegawa airliners, there are no windows molded into the fuselage, these being represented by decals. One has the choice o building the model with gear up or down. A stand is provided for gear up as is a plug for the lower fuselage. The hold for this needs to be cut away by the builder. Going gear up will eliminate about half the parts count for the kit. A fuselage center section 'gear up' piece is provided as are closed nose wheel doors. 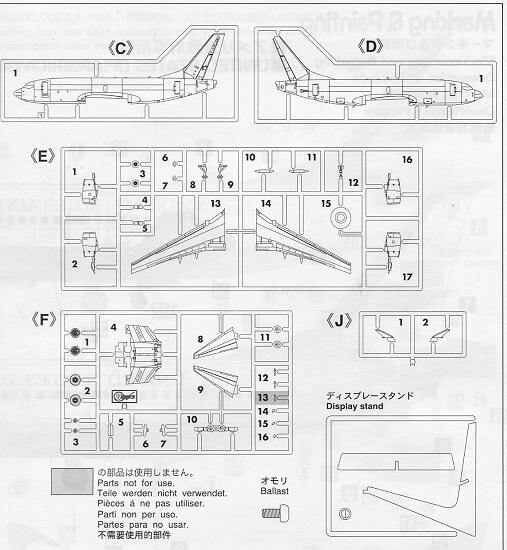 The kit center section also has stub sections for attaching the outer wings, The winglets are also separate items that need to be attached. If one wishes to do gear down, a bulkhead a nd a large screw for ballast is provided. Instructions are quite well done as should be by one of the industry leaders. The usual Gunze paint references are provided. Markings are for one scheme with two serial numbers. No unit is specified, but it is either from the 89th AW, 15th AW or the 932nd AW. Judging from a photo I took a few days ago, at least one 05-4613, is from the 932nd AW. The other 932 AW plane I've photographed is 05-0932. The other serial option on the decal sheet is 05-0730. Please note that the engine pylons are the same Boeing Grey (Model Master Voodoo Grey is close) as the wings. The decal sheet provides white decals for the outer portions of the winglets, but in reality, this is the same grey as the wings. Of course, all the blue areas will have to be painted on. The decal sheet does, however, provide the gold pinstriping. Once the folks at the 932nd find out a model kit has been made of their plane, it should sell well in Illinois. Aside from all the masking needed when painting, it should be a pretty simple build. One can scan the decal sheet and use that as a mask for the somewhat complex pin striping shapes.